The lovely people at Isabella Oliver very kindly sent me a gorgeous nursing top to review! I first became aware of Isabella Oliver during my first pregnancy when another lady at my NCT group wore a beautiful white portrait top. I became instantly envious but didn't feel there was enough time left to go to warrant buying the top. As soon as I was pregnant again I immediate bought the self same portrait top which now lies in its box with tissue wrapping in a sacred place in my bedroom. I felt lovely wearing it when I was pregnant although tried to save it for special occasions. Now I am nursing I've realised I can still wear the portrait top as it has nursing accessibility. 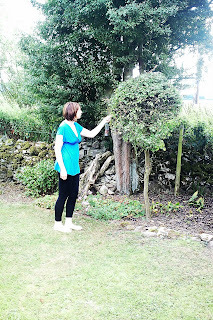 I was thrilled to see that Isabella Oliver also do nursing tops and immediately treated myself to the Olivia nursing top. I wear it over leggings and jeans, it is great for feeding in public as it is very discreet and allows easy access for baby with maximum coverage. 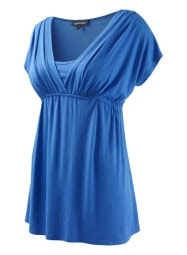 Anyway, back to my review, I was sent the Izzy top in "ocean" as seen in the picture above. When I opened the box I felt like it was my birthday and Christmas rolled into one. IO certainly package their clothes in a very lovely way, it really makes you feel like you are receiving a treat. The top itself is made from a lovely cool material which is perfect for summer, or would look lovely under a cardy in colder weather. I actually think the top would work during pregnancy as the fabric is quite stretchy. I wear the top over (optimistically worn) skinny jeans but I think it would work over any trousers. The colour of the top is quite lovely and really suits pale skin tones (like mine!). The neckline is cut really nicely too and looks really flattering, especially for those with a pear shape figure as the wide top provides balance. Unlike other nursing tops this doesn't actually look like a nursing top. I could easily wear it when I have finished feeding and feel very chic in it. Here is a picture of me wearing it without baby! As you can see the colour is really stunning and it falls really nicely. The only slight problem was that I possibly should have gone a size up as perhaps a size 2 was a tad optimistic! The elastic under the bust sometimes needs to be pulled down, but I don't think this is a problem with the design but is down to me wearing the wrong size. I'm really glad I discovered Isabella Oliver, a good reason to have another baby!